Life is made up of experiences; some sweet, some not so good, some which you just want to lock up in a treasure chest and keep close to your heart and some you wouldn’t want to touch even with a barge pole. These little and large, bitter and sweet memories come together and form the screenplay of life. We may not remember every one of our experiences but most of us have pretty vivid memories of the various ‘firsts’ in our life… the first crush, our first job/ paycheck, our first drive may be. Only the thought of them is enough to make you smile. This post is about one of my first experiences, my first attempt at baking bread. I have always been a breads person. Give me bread and butter for breakfast and I’m sold. Bandra, where I grew up is famous for numerous bakeries where freshly baked bread is available round-the-clock. So, for all this self-professed affinity to bread, I never attempted to bake it. The reason? Baking, my Achilles heel. Somehow, my baking attempts have not been satisfactory. I have a pretty decent oven who behaves himself most of the times, I grill, I toast, I even managed to get the perfect roast chicken but when it came to baking, a cake or muffin was only as far as I got. So baking bread which I was told was an experts domain, remained a distant dream. I always wanted to bake bread but somehow never got myself to do it. Much like the shy, introverted good guy in college who secretly aspires to ask his lady love for a date, but doesn’t have the courage to do so. Not that I didn’t try, I did make the occasional prep but backed at the end moment; just like the shy guy in college would have his fears what if she snubbed me? What if she refused? I had my doubts, what if it didn’t come up as well as it should? What if it didn’t sound hollow when knocked. Amongst all this one thing was for sure, she was his lady love and he had to win her over. The moment of truth came in when on a very lazy Saturday when I happened to walk to my kitchen and began to scan the cabinets to search something. There it was, yeast and flour cheekily peeping at me. Which One? 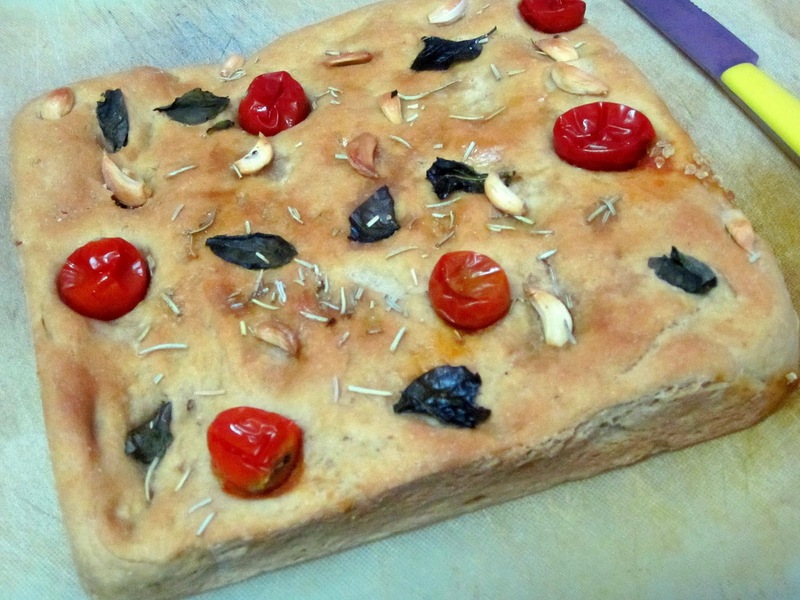 Focaccia was the easiest to make. That was it. I will make bread I thought. I started kneading the dough; gently cajoling and caressing it. With each gentle caress, she responded more eagerly. I learnt to handle her. Handle her well. She moved from being a powdered mess to a a gentle dough. First part done. I was happy. Now it was time for her to respond. I gave her the space and time she needed. She responded by doubling in size. A few more gentle caresses later, she was ready for another rest, before the final test of fire. Literally. I gently laid her in the tin drizzled her with olive oil and Salt. Then, with a prayer on my lips, adjusted the settings of the oven. The wait would be a good 35 minutes. I picked up a book from the shelf and started to read. The oven timer went off after almost an eternity. I rushed to the kitchen and there she was; resplendent in all her glory. Shiny crust, nicely risen and a very satisfying hollow sound when tapped at the bottom. I was ecstatic. My joy knew no bounds. That evening we had bread and chicken stew for dinner. Pure sensory delight. That night, I went to bed a very satisfied man. After a lot of time and effort, I had mustered the courage to approach my lady love. To my surprise, I got to know that she loved me back. We confessed our love and promised to be together. Forever. 150 ml, extra virgin olive oil (please don’t use any other oil) + some more to sprinkle on top of the bread. Active the yeast by combining it with the sugar and warm water. Leave aside for 15 minutes. In a large bowl, combine the flour, salt together. Now make a well in the center and add the yeast solution. Knead till it just about comes together. Add the olive oil bit by bit and knead in stretching motions till the dough has formed a single smooth mass. Cover the dough with a damp cloth and leave it in a warm place to prove. This will need about 45 minutes to an hour. One the dough has risen, knock it back gently, and deflate it. Then, give it a knead for about 8 minutes. Grease a square or rectangular baking tin and put in the dough. Gently create small dents in the dough and put in the tomatoes, garlic and sprinkle the rosemary. Sprinkle salt and olive oil in on the dough and bake at 180 C for 35 minutes. Labels: baking bread, Easy Whole Wheat FOcaccia, Life experiences.